DALLAS, Texas – Bishop T.D. Jakes of The Potter's House and CEO of MegaFest 2013 was joined by the Mayor of Dallas Mike Rawlings on Wednesday for a press conference to kickoff the three-day inspirational festival that the popular megachurch pastor says will be a "celebration of relationships." More than 50,000 people from 40 countries are in "Big D" for MegaFest that begins Thursday morning with a taping of two episodes of "Oprah's Lifeclass" in which she and Jakes will tackle the issue of emotional and spiritual healing for the millions of children who are growing up in fatherless households. Speaking about healing and the purpose of MegaFest, Jakes quoted from part of Martin Luther King Jr.'s speech that he gave 50 years ago during the March on Washington, and said it was King's dream that everyone would work together and unite together. Jakes commented that the message exemplifies the spirit of MegaFest, which is to bring together people from all walks of life, culture, ethnicity, background and political ideology. This year marks the first time since 2006 that MegaFest has been held in the United States, and a first-ever event for the city of Dallas, the location of The Potter's House. "I have always wanted to bring it to Dallas for as long as I have been here, and for many, many reasons," Jakes said at Wednesday's press conference." Jakes said that MegaFest incorporates many of his interests, and will include a variety of conversations where people can explore their faith, but also be exposed to wide array of thoughts and ideas. "It is more than a conference," Jakes asserted. "It's a festival. It's a celebration. It's a commitment to the American spirit, that no matter what we go through, no matter how tough, no matter how dark the night, somehow we always land on our feet. And when we do, in spite of how difficult, we should take the time to celebrate the momentous occasion, and to enjoy the festival and fellowship. Because when we start to say thank you and to enjoy the moments, then that is worship at its best." "The amazing thing about MegaFest is that we have something for all age groups," he explained. "We're not just having a conversation with adults, but we're having a conversation with their children, of all ages – to impact them with faith and to inspire them with the possibility that no matter what circumstances you grew up in, you can escape those circumstances and soar on the wings of those possibilities, into infinite ideas and concepts – that's my hope." The multitude of events include Jakes' most popular conferences: ManPower, Woman Thou Art Loosed, MegaYouth and MegaKids, along with Pastor Joel Osteen, the International Faith and Family Film Festival, empowerment sessions, a gospel concert with LeCrae, a comedy show with Cedric The Entertainer, and the Women of Purpose concert featuring Jennifer Hudson and Babyface, among many others. Jakes said he wants people to experience MegaFest for the "power of its spiritual content and its intellectual range," but he also wants families to enjoy their time together – enjoying meals, sharing rooms, and packing bags and traveling together. "Maybe I'm nostalgic, but the best moments of my life were eating a little foil-wrapped sandwich in the back seat of my parents' car traveling from West Virginia to Mississippi. Those moments with my family helped to define who I am as a human being. I want to create an environment where families will come together, stop their schedules for a minute, and spend some time together to talk and laugh and pray together – that's our hope." Jakes believes that MegaFest can be the catalyst that gets family members home in on their Christian ideals, vision and purpose as they navigate all of life's challenges together. "I believe in the family," he said. "I think that family is the one nesting place that God gave everyone to refuel. It doesn't have to be flawless or perfect. But it must be preserved at all costs." He also wants the experience to inspire all who attend and "leave them a little bit better, a little bit stronger, and a little bit wiser." 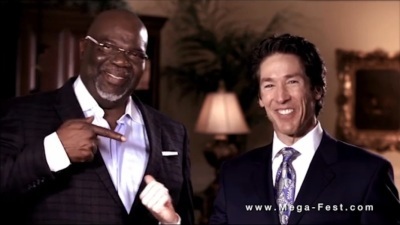 Commenting about megachurch pastor Joel Osteen, the senior pastor of Lakewood Church in Houston, Texas, Jakes said Osteen's presence at MegaFest speaks to the fact that they are not in competition, but in collaboration. "It speaks to the fact that the church must come away from nuanced ideas of black churches and white churches, and finally become the church of the Bible – the blood washed church. I hope that we'll see that diversity in the audience at MegaFest," Jakes said. Martin Luther King Jr. spoke of the segregation in the churches on Sunday mornings, and Jakes asserts that it continues to haunt the Christian church today. "I think that we must do a better job of extending our arms wide enough that all intimidation of meeting together around the cross would be dismissed." Click here for more information about MegaFest and event details.